The Achzarit heavy Armoured Personnel Carrier (APC), which has the same protection as a main battle tank, is a unique IDF solution for maintaining soldiers’ fighting capability in urban combats. The Achzarit is based on the captured Soviet-built T-55 tank. Its turret was removed and the chassis modified for troop carriage by adding a troop compartment. Armour protection was strengthened. A weapons station against light armoured targets and soft targets was installed on the top of the vehicle. A more powerful engine was also installed for better maneuverability. Since 1980s, the Achzarit has always been deployed to the most dangerous zones. Its excellent performance in the battles makes it a reliable “warhorse” for the Israeli soldiers. 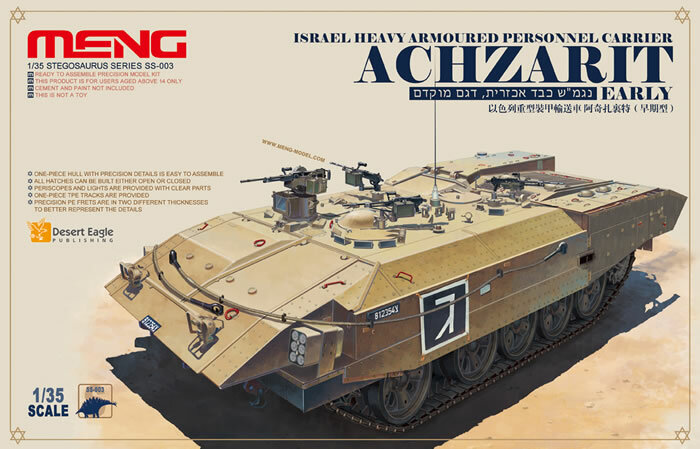 This 1/35 scale SS-003 Israel Heavy Armoured Personnel Carrier Achzarit Early kit consists of 242 parts on 10 sprues, 1 PE fret and 2 TPE tracks. It provides decals and paint schemes for three units. As previous MENG’s Israeli model kits, this kit is also supported by Desert Eagle Publishing’s most authoritative reference material. MENG’s team not only focus on accuracy and details of the model, but also optimize the building process. Hope you will enjoy it. More information about this release will be available in the coming weeks. Thanks to Meng Model for the images and information.